“The Perfect Art of Doing Nothing” -W.I.S.E. Project 2016 – Dancing in the rain! Our minds are similar to our google search history. They carry our past, our present and our future. It’s a stuggle to be mindful and learn to live in the present with 3000 browsers open at once. In learning to be more mindful I need to take myself out of my comfort zone and this past weekend I had an experience that was very unique to me and I believe I used all of my January W.I.S.E. principles; Wonder, Imagination, Smile and Energize. When I first booked my appointment at Floatique I was looking to energize and I thought it would also be a great tool to help in my quest to be more mindful. 90 minutes in a Float Pod doesn’t allow you the opportunity to do much else so I thought it would be an amazing way to live in the moment. As the appointment drew closer I found all sorts of ways to stress myself out. Would I be bored for 90 minutes? Would I be claustrophobic? Would I be able to shut my mind off and relax? 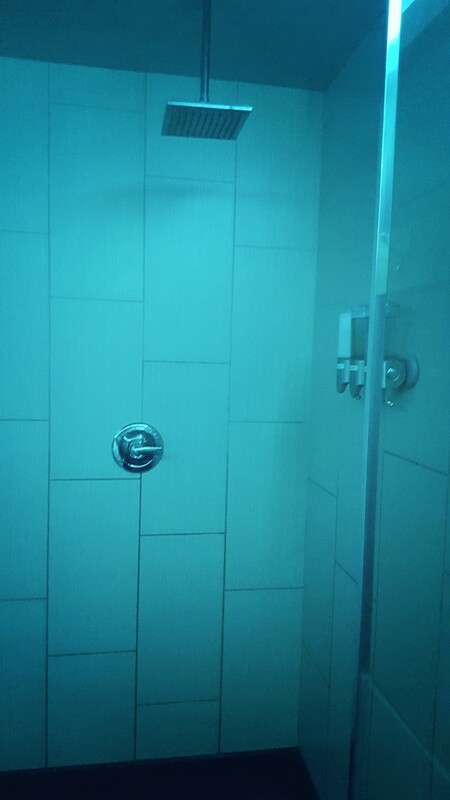 The morning of I felt quite excited and the quiet, calming atmosphere of Floatique helped me to clear my mind. The wait area is neat, tidy and uncluttered. I had a few quiet moments with my thoughts and I picked up John C. Lilly’s book The Deep Self-Consciousness Exploration in the isolation tank. The book was written over 20 years ago by Lilly, a great scientist, possibly a generation ahead of his time. Drawing on the personal testimony of many who tried floating the evidence shows how, by eliminating the presence of shifting physical input patterns, the tank allows participants to dive deep into their subconscious and focus immediately on their inner perceptions. There is a help button inside the pod and a button to control the lights, you can float in complete darkness or in ambient light. Immediately upon entering the pod I was impressed by it’s spaciousness and after getting a feel for it I turned off the light to get the full experience. The weightlessness, silence and the darkness made me feel like I was in the middle of the ocean instead of in a tank. 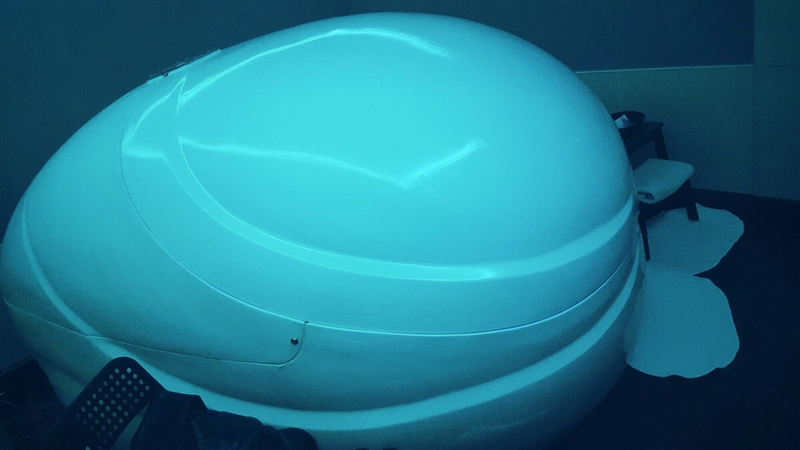 Floatation Tanks (or sensory deprivation tanks) contain over a 1000 pounds of Epsom salts dissolved in ten inches of water. Needless to say, you are extremely buoyant. My mind played ping pong for a bit. I was torn between being extremely relaxed to making a grocery list and recounting the fight I had earlier that morning with my 16 year old daughter. I scolded myself because what I really wanted to experience was a “mind~body~soul” connection, not a repeat of everyday only in a float tank. It’s a hard task to shut your mind off and live in the moment. I am sure with enough training you can treat it like a switch but I am definitely not there yet! I started repeating “mind~body~soul” over and over, quietly in my head. In doing so I was able to focus on just that and my body began to move to the invisible rhythm. I was able to stretch out completely in the float tank with my arms above my head and just lay there weightlessly and move fluidly. My friend had mentioned wishing that they had had a pillow as it was hard on her neck. Floatique does provide a small noodle for this reason but it is one hundred percent unnecessary. The strain you put on your neck is self induced. You are completely buoyant, all you need to do is trust and relax. If you are unable to do that immediately I would fold your arms behind your head to give you a sense of security. My first advice is to come with an open mind. This was a fabulous experience for me and I am going to have a hard time putting it into words without sounding like a raving lunatic. You must understand that that we are all unique and therefore our experiences will be as well. Water is a mystical element that can revamp our lives if we are willing to open our hearts and mind to its gifts. Being alone with my thoughts and feelings was really freeing and eventually my awareness of my senses was altered as well. As with any environment, my senses began to adjust; I was able to focus on the sounds and feelings my body makes, including the soft swoosh of the water as I moved. After a couple minutes the silent “mind~body~soul” became automatic as did the way my body moved to the rhythm. My movements evolved from small and languidly to larger but effortless flow. It sounds almost silly to say but I became one with the water, or the water became one with me. Because of the buoyancy of the water it was hard to determine what was water and what was air. I imagined myself in the middle of the ocean without a care in the world. The pod was silent, yet there seemed to be very faint music, I think it was only the rhythm I created with “mind~body~soul” and it led my body in what seemed to be a water dance, a soft, fluent sway. I can recall my movements becoming more energetic and I was smiling from ear to ear. I felt euphoric and I had no sense of time. I wanted to flip over and swim further into the abyss. I am pretty sure I thought I was a mermaid. I felt like a mermaid. The Epsom salt leaves your body feeling silky smooth. It can actually be quite a sensual experience, with nothing between your satiny skin and the luxurious water. Because the water is the same temperature as your body after awhile you don’t feel it. It’s like peeling away the layers of your mind. The first time you may only peel away the first layer but I think if you free yourself you can get to the centre and experience complete and total relaxation. Letting go is a hard thing, but so worth it. What are we saying goodbye to but exhausting stress, anxiety and fear? 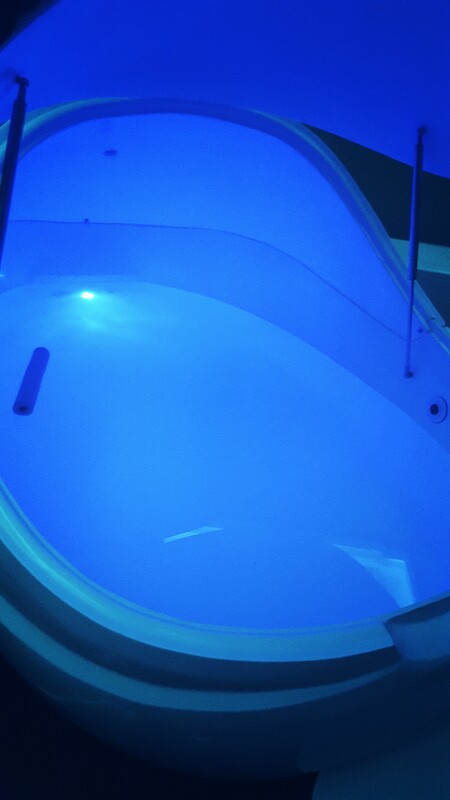 I have purchased the monthly float package which gives you a float a month for $59, additional 90 minute floats are $55. You can share the package with another person as well. If you’re ready to go on a meaningful journey to relaxation and wellness I would recommend giving Floating a try! In Edmonton you can contact Floatique Rest Centre HERE or check listings in your city for Floatation Therapy. Pingback: The Sound of Silence-W.I.S.E Project 2016 – Dancing in the rain!